Poor maintenance in the past? I've seen tapered hubs and front spindles like that, that were originally set up to use leather, or felt oil/grease seals. The seals will adjust to fit snuggly. As the tapered bearings wear and adjustments are made for the wear, the seals sit further onto the tapper and also adjust for wear. 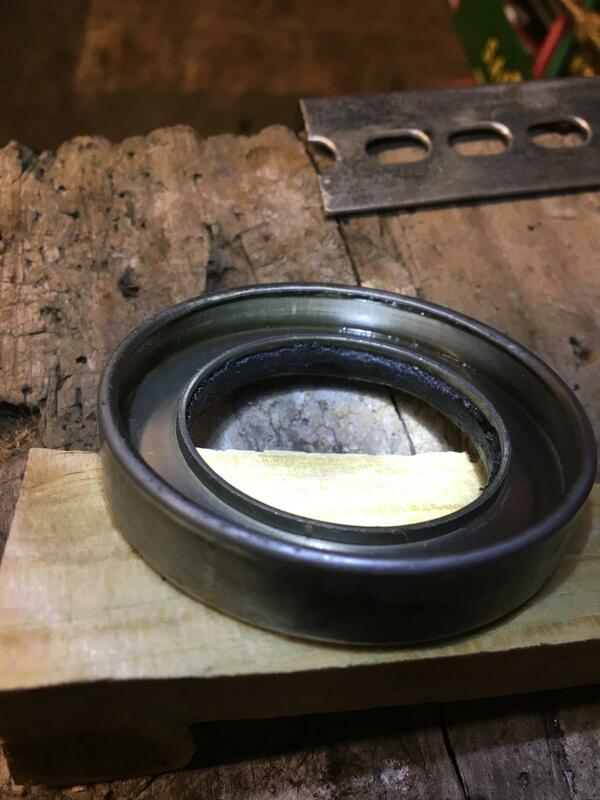 Plus, when new bearings are installed, those old leather/felt seals can be removed from their retainers, cleaned in solvent, and then shimmed back to an original snug fit by shimming with strips of paper down in the retainers. Dodge 8 is the same. They are supposed to be that way as my '36 has them too. Mine were worn badly where the seal ran so I had a local machine shop weld them up and turn them down to a smooth tapered surface. You can see the worn area in the photo. Same on my 1932 Dodge Brothers DL sedan. Seems to be common on thirties Chrysler products. Correct, this is how they were made. There is a predetermined end float on the axle and I guess the taper alowed for side movement within the seal. Like your hubs, 80 years on most have wear/grooves in the seal areas, currently working on a solution to turn hubs down parallel and adapt a modern seal to fit the old outer seal case, have had limited success retro fitting a modern seal to work on the tapered surface but with too much wear its only been a short term fix. I had mine turned parallel and fitted a modern seal. 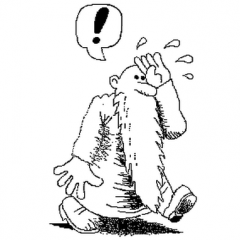 Why try to reinvent the wheel? Any good machine shop can repair the old drums and new original type seals are readily available for the WPC cars. I guess, perhaps for other makes where the seals are hard to get, machining the drums straight would have to be an option. There rarely is any need to put in a modern lip seal with a tapered rubbing surface. Yes, figuring out where on the taper it contacts so you can get a lip seal the right size is tough. And modern lip seals won't last as long as the original leather or felt seals do. The originals have afar greater contact width so the force per square area is less. Plus, felt and leather hold oil to better self lubricate and they work better at excluding dust in the contact area so they wear the contact surface far less over the same miles traveled than a modern lip seal will. But, when dust gets in under the edges of a lip seal by mixing with the oil there, it becomes a grinding paste. Within a few thousand miles it will not only wear the very thin contact edge of a lip seal, it will also grind a groove in the contact surface. That's why they also sell press-on repair sleeves for standard sized lip seal contact areas. As I mentioned above, you can remove the leather or felt seal from it's sheet metal retainer, wash it in solvent such as lacquer thinner, and then place strips of paper down inside the retainers to shim the leather/felt back to an original snug fit. Then it's good for another lifetime or two. Lip code P is for Polyacrylate, which is for use with EP additives and higher operating temperatures. So you know of a source for a sleeve to fit a tapered surface ?? No, I don't. They don't make them simply because the tapered surfaces were not meant to use a modern lip seal. 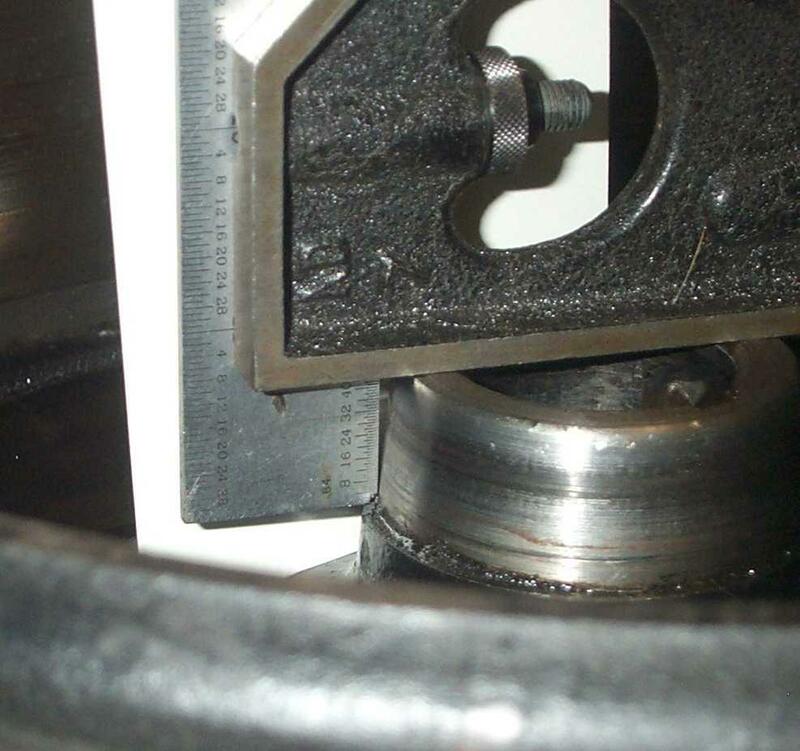 However where a modern lip seal was used in later manufacture, the seal manufacturers offer a wide range of sleeve sizes to press onto the contact surface to cover the groove worn by the previous lip seal's contact edges when replacing it. You can order them through a bearing and seal supplier. With a leather or felt seal, grit imbeds into the fibers and does not get rubbed between it and the contact surface with force the way the firmer surface of a lip seal will. Much like the far softer surface of babbitt bearings helps protect and extend the service life of crankshaft journals from the grinding action of wear particles. Read the second paragraph of the SKF link to understand what happens with road, and/or, brake dust and a lip seal. Some wheels don't need to be reinvented when their proper function is understood. Thanks, yes more than familiar with bearings wear, tear materials etc. My original response was, what to do when a tapered surface is worn beyond the ability for a tapered surface seal (be it modern or otherwise) to do the job. As others have suggested, turning the surface to a parallel profile or welding said surface and re machining seem to be the only viable alternatives. Not something I've had to worry about. In nearly 37 years of working on 1920's to 1930's antiques full time, I've never had a tapered seal surface so bad that the leather, or felt seal couldn't be made to reseal it properly. Maybe just luck, but I think it's more a case of a grease and oil sealing design that is more forgiving of a worn surface and the dusty road conditions these cars were original designed to withstand. Too often we tend to underestimate the simple solutions early engineers came up with and think that modern solutions are better in such instances. A goodly percentage of my work load is fixing the repairs "inflicted" on these old cars by people who thought they knew better ways to do something than the engineers that built them. Plus, there are instances were installing modern seals will actually cause leaks. The surface in 1937P4's picture is normal wear for the 80-90 years of driving of the cars I work on. While it might need machining to get a surface smooth enough for a lip seal, I know from experience that I can easily get it to reseal properly by just cleaning and shimming the original leather or felt back to a snug fit. If someone wants to pay a machine shop to change that design, that's certainly their right, but I don't see it as necessary in an instance like this. By the time that drum is delivered to a machine shop, with just a small can of lacquer thinner and a sheet of computer printer paper and scissors, I can clean and shim the original seal back to working well as it did originally. It will outlast a modern lip seal, save my customers money, and keep the car that much more original. 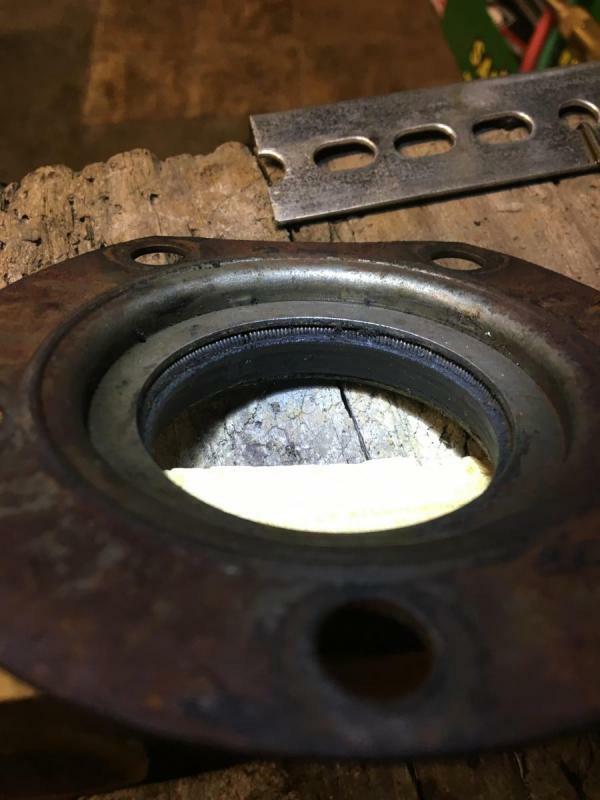 For those that wish to keep their car original as possible while saving some money, they are not always stuck with having to modernize it to get it to seal. These tapered seal designs can often be repaired and it's a low-tech repair that doesn't require expensive equipment. Hello everyone. Chad here working on getting my first car back on the road. 1937 plymouth p4. First system is the brakes. I have the drums and shoes at the machine shop and I am very keen on sealing up the system (grease and oil seals) as prudence dictates. I DO NOT want to reinvent the wheel or seals for that matter. Pfitz, I have taken your advice and have the felt of the front(riveted to the backing plate) seals soaking in thinner. 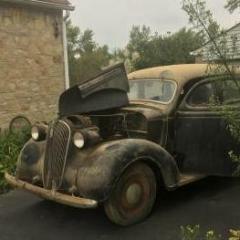 I have owned the car for 30 years and don’t know the history previous to that. The other seals on the wheels(bolted to the rear backing plate and pressed into the front drum) are rubber. There is a cavity on the front seal where felt might have been removed at some point. Any advice on keeping grease and oil from the brakes is greatly appreciated. Your first picture looks like the remains of a modern lip seal with the lip worn off ????? Your second picture looks like a typical leather seal of the 1920s and 30s, with it's tension coil spring nesting inside it. It is retained into the flanged mount that it's in by the sheet metal ring facing upward being pressed into that mounting. You don't need to disassemble it to clean it. As long as the leather is not torn or worn through, they can be cleaned in solvent, re-greased, and put back into service. Never put them in dry - use regular wheel bearing grease and it'll work fine again.